This article is a short summary of Bird & Beans. The logo of Bird & Beans. 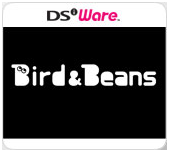 Bird & Beans (released in PAL territories as Pyoro) is a DSiWare title released as a spin-off of the WarioWare series, based on and a remake of the "Pyoro" and "Pyoro 2" minigames in WarioWare, Inc: Mega Microgame$!. The game was released as a launch title for the DSiWare service in Japan in 2008, and was later released in other territories in 2009. It's raining beans! Can Pyoro the bird catch them all? Wario Land: Super Mario Land 3 • Virtual Boy Wario Land • Wario Land II • 3 • 4 • Shake It! This page was last edited on 6 October 2016, at 23:02.